Back in the '90's, my buddy Brad and I would load up skies in April and head up to Sierras for some of the best skiing of the year. The weather was always clear and sunny. The snow was hard, but not icy. Now that I have 2 young boys, I like them to experience the same warm snow phenomenon that I got to experience. I told my 2 boys that the best time to go sliding in the snow is in the summer because the weather is much warmer and the snow is hard packed. I loaded our family Subaru wagon the first week of June and made the trek to Lassen Volcanic National Park. I packed all of our family camping equipment including the kids winter jackets boots, and 3 colorful snow saucers. I reserved 3 nights of camping at Manzanita Lake campground located at the north entrance to Lassen Volcanic National Park. Even though the Lassen area received less than "normal" amount of snow, there was plenty of snow for sliding at 7800 feet. The road opened early this year the first week of June. When the area receives an abundance of snow, the road through the park can still be closed until mid July. We arrived the summit at approximately 3 PM and my 2 boys quickly donned their winter gear and immediately started sliding. We parked in a small parking just below Bumpass Hell. It was such a thrill for them because it was warm and sunny and the hill was very slippery. 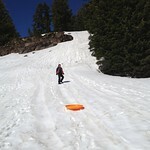 What I like about spring and summer sliding is that the snow is densely packed and very easy to slide on. It's also much easier to walk on than new snow. 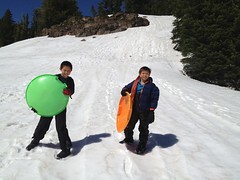 This is the second time that we have let the boys slide in Lassen during the summer. This time we came prepared and brought along colorful snow saucers. Our kids had so much fun that we came back the next day with another 4 kids. When I was a child growing up in Minnesota, I looked forward to the long winters that produced snow for sliding. I could stay outdoors for hours and not feel cold. My 2 boys were no different. They were tireless and never complained about getting snow inside their boots and pants. If you have never been to Lassen Volcanic National Park, I highly recommend it. There is a lot of thermal activity going on with boiling mud points, cinder cone volcanoes, and hot steam rising from the ground. Some of the thermal areas remind me being in Yellowstone National Park. Since the park was still snowed in, we were not able to take any long hikes like the Bumpass Hell trail that brings you to the most exciting thermal areas of the park.